For English recipe, scroll down. Cu acest post inaugurez o sectiune noua pe blog, si anume sectiunea deserturilor cu capac, adica la borcan, borcanel, borcanas… ma simt foarte inspirata de ideea de pune un desert delicios intr-un borcanel mic, frumos, cu dichis – devine parca un obiect pretios, mai valoros… a, nu, si asta nu e doar o justificare pentru inclinatia mea de a-mi cumpara tot felul de containere/ cutiute/ borcanele mititele si dragutele dar inutile (cel putin pana acum). Postul de fata e inaugural pentru conceptul desertului in borcanel, si nu are nici vreo mare dificultate, si nici poze pas cu pas. Budinca de gris am facut-o cu: 250 ml lapte, 3 linguri cu varf de gris, 3-6 linguri de zahar (in functie de cat de mult va place), 20 g de unt (optional, am avut lapte degresat). Am pus pe foc laptele cu zaharul si untul, cand laptele s-a infierbantat am adaugat grisul si am amestecat continuu pana cand budinca s-a ingrosat bine (dar era inca moale, ea intarindu-se pe masura ce se raceste). Am turnat in 3 borcanase. Sosul de zmeura l-am facut la la cheesecake-ul cu sos de zmeura (aici – poze ale procesului): 75 grame de zmeura congelata amestecat pe foc cu 2-3 linguri de zahar, pana cand zaharul se topeste si zmeura se paseaza. Nu am mai strecurat de seminte, am adaugat o lingurita de amidon si am amestecat pana cand sosul s-a ingrosat putin. Am turnat peste budinca de gris. With this post I inaugurate a new blog section, namely “desserts with a lid”, actually meaning “in a jar” … I feel very inspired by the idea of putting a delicious dessert in a small, beautiful, fancy jar – it feels like making it precious, more valuable … and no, that’s not only a justification for my inclination to buy myself all kinds of containers / little boxes / tiny jars, cute but useless (at least so far). 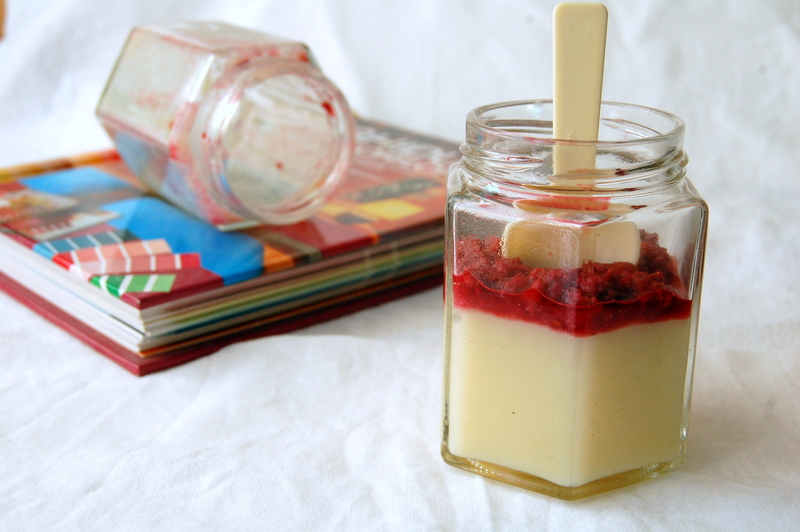 This recipe is explaining the concept of “dessert the jar”, and has little difficulty, and no step by step photos. Semolina pudding I made it with 250 ml of milk, 3 tablespoons semolina, 3-6 tablespoons of sugar (if you like sweet sweets, you could use 6 tbsp), 20 g of butter (optional, I had skimmed milk). I heated the milk with sugar and butter on stovetop, when the milk was hot I added semolina and mixed constantly until the pudding has thickened well (but it was still quite fluid, it sets as it cools). I poured it in 3 jars. Raspberry sauce I made it as for the cheesecake with raspberry sauce (here – pictures of the process): I mixed 75 grams of frozen raspberries in a pot with 2-3 tablespoons of sugar, and heated it on stovetop until the sugar has melted and raspberries were mashed. I have not strained the seeds, I added a teaspoon of starch and I mixed up the sauce has thickened slightly. I poured on top of the semolina pudding.